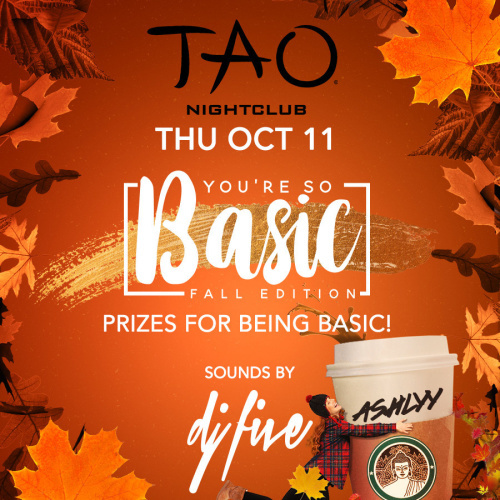 TAO celebrates pumpkin spice and everything nice for a special edition of Worship Thursdays on October 11th with sounds by DJ Five! Dress in your most BASIC Fall essentials for the chance to win prizes in a custom wind tunnel prize booth at TAO Nightclub! With Instagram-worthy Fall photo moments at every corner, curate your cutest collection of Fall-inspired social media highlights in a custom photo booth and welcome Fall in style at TAO. Guests dressed in their Fall (basics) best will walk the catwalk to receive some of the season's most coveted Fall essentials!